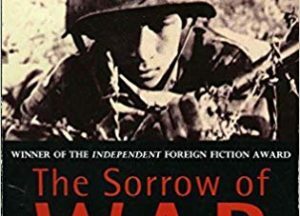 Not for the first time but likely the last,in 1997 a dozen or so senior level Viet Minh and American OSS officers held a public reunion at the Asia Society in New York City. 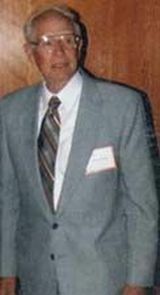 Among the OSS agents present: Charles Fenn,who contacted Ho Chi Minh to rescue downed Allied pilots and send intelligence and weather reports to the OSS. 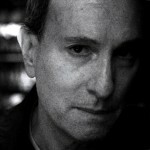 Henry Prunier,who parachuted into Tan Trao to provide small arms and training and who marched with General Vo Nguyen Giap,later hailed as the architect of America’s defeat in Vietnam. And Frank White,who served under Peter Dewey, possibly the first American killed in Indochina. 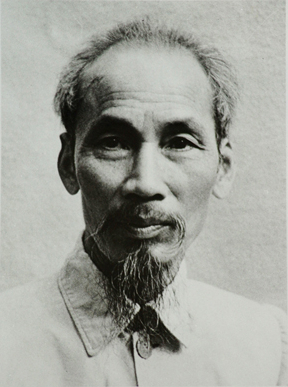 Among the Viet Minh:Tran Minh Chau,Head of the Administrative Office of Tan Trao, prior to 1945. Nguyen Chinh,who worked with Tran Minh Chau. 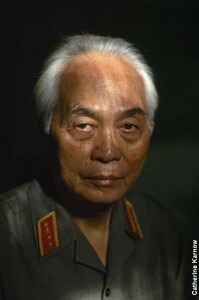 Nguyen Kim Hung, commander of the Viet Minh/OSS team that worked together in 1945. And Trieu Duc Quang and Tran Trong Trung, who served under Nguyen Kim Hung. Few Americans know that Ho Chi Minh worked for the US government. During World War II the Office of Strategic Services (OSS), forerunner of the CIA, operated in southern China and Southeast Asia. 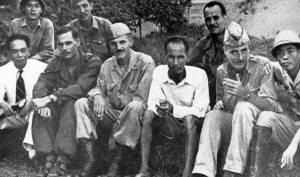 After the Japanese invaded the French colony then known as Indochina OSS operatives collected reports from French agents living under loose Japanese rule. After the Japanese took complete control in 1945 they arrested all French citizens, including all OSS contacts. Around this time a group of Viet Minh (forerunner of the Viet Cong) emerged from the jungle escorting a downed US flyer to safety. The group was led by Ho Chi Minh who for many years had sought Vietnamese independence. Previously,French agents had informed the OSS that Ho was a communist. However the US administration felt the Japanese might move from northern Vietnam into southern China and instructed the OSS to ignore Ho’s leanings. He was too valuable an asset against the Japanese, and his goals dovetailed with the official US strategy:defeat Japan and support, at least in words,Vietnamese independence. Thereafter the OSS referred to Ho as Agent 19 (code name Lucius) and began training the Viet Minh in combat,providing weapons,explosives,radios, food and money. In return,Ho and the Viet Minh provided the OSS with weather information (there were no satellites),harassed Japanese troops, rescued shot down American flyers and provided intelligence about the Japanese. At wars end the OSS-Viet Minh alliance faded even though America expressed sympathy for Vietnamese self-rule,in stark contrast to the British and French aim of re-establishing French authority in Indochina. Ho proclaimed complete independence after the Viet Minh led “August Revolution” but no country recognized his provisional government. Ho petitioned Truman and the Department of State for support but his letters went unanswered and unacknowledged. Some historians feel the OSS-Viet Minh alliance was a lost opportunity. Actual participants imply that if Washington had listened to Ho Americas long war in Vietnam could have been avoided. 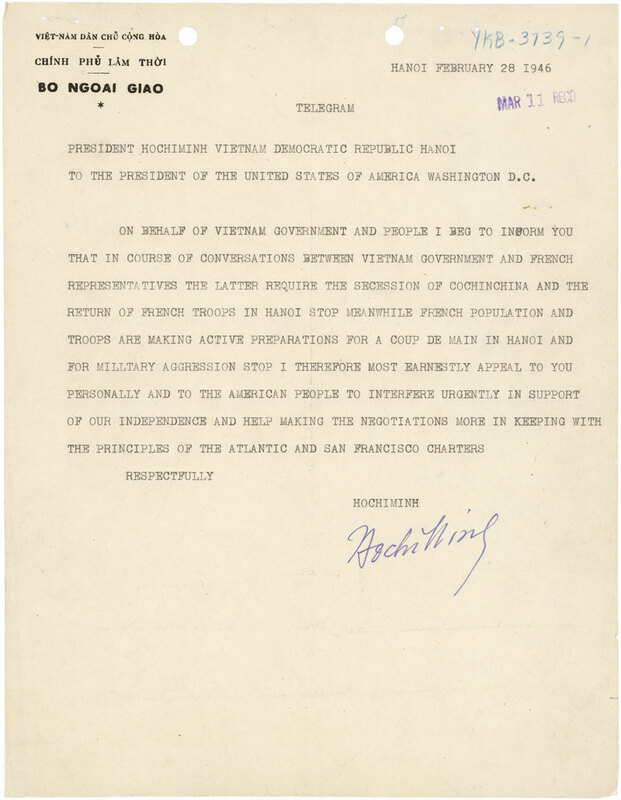 In 1950 Truman sent the Military Assistance Advisory Group to Viet nam to supervise the use of $10 million worth of military equipment to support the French against the Viet Minh. 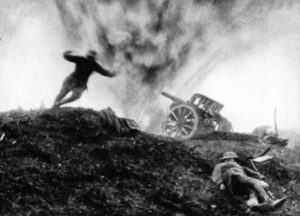 However the French military was resistant to MAAG oversight. Four years later, lead by Nguyen Vo Giap, the Viet Minh defeated the French in the battle of Dien Bien Phu. 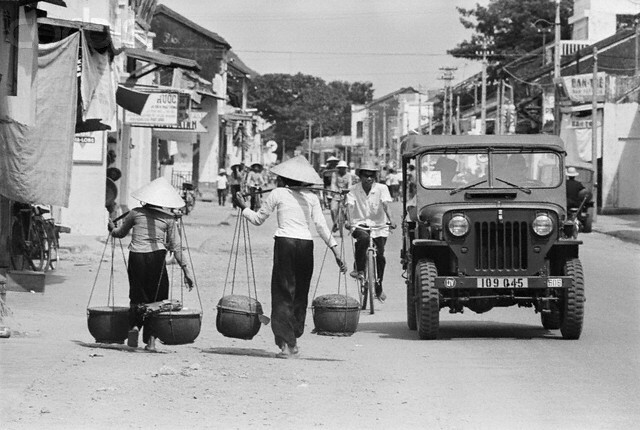 The 1954 Geneva Accords proclaimed Vietnam would become an independent nation with an elected government for Vietnam. 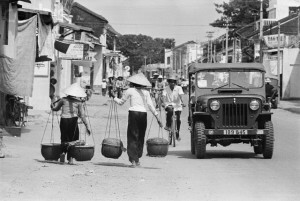 Until the proposed 1956 elections the country was split at the 17th parallel into the North and the South,with Ho and the Viet Minh agreeing to go North. During this time President Eisenhower sent increased MAAG funding and military advisors to the Diem government to ensure a noncommunist South Vietnam. The Kennedy administration famously escalated US military aid and advisors (i.e. Special Forces and CIA personnel) to the South, setting in motion America’s long war in South East Asia. 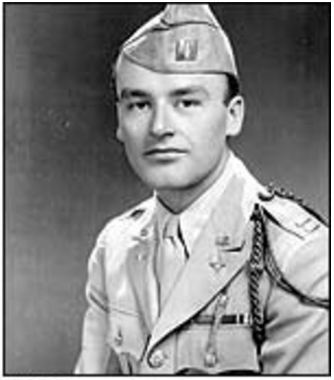 Sometimes called America’s first Vietnam War casualty,Peter Dewey was born in 1916 in Chicago.The son of a Congressman,educated in Switzerland and at Yale,he saw action in World War II; through family connections he joined the OSS shortly thereafter. 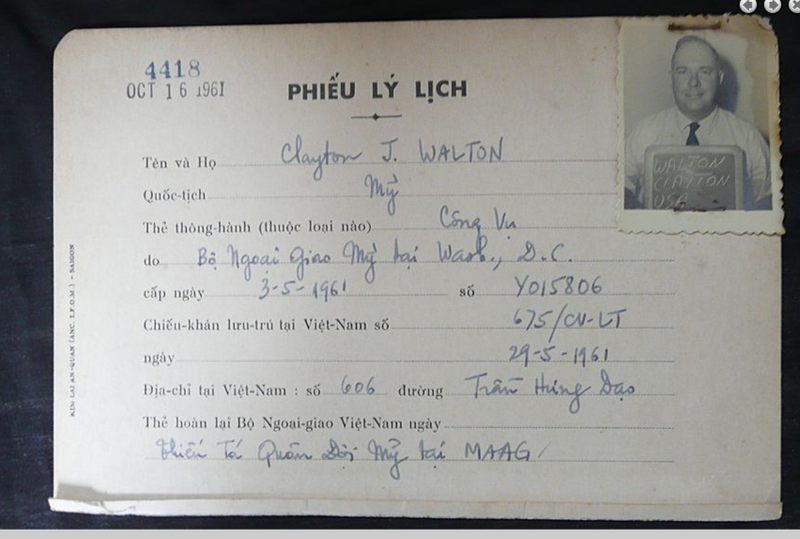 His arrival in Saigon in August 1945–to arrange for the repatriation and evacuation of U.S. POWs who had been held by the Japanese–angered the French and British,who warned Dewey against his sympathies to Ho and the Viet Minh. In the complex alliances and political turmoil of the day,tensions were further heightened by the Potsdam Conference,which divided Vietnam in half in order to disarm the Japanese; the violent August uprising announced by Ho; and provocations by the British and French, which put the Viet Minh on alert. 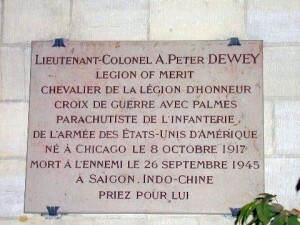 Dewey communicated his displeasure to Washington about the British treatment of the Vietnamese. During the final week of September 1945 the British pressured the OSS to recall Dewey back to Washington. 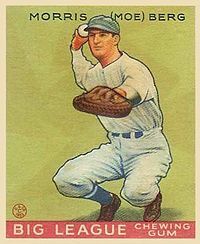 There are various accounts regarding how Dewey died. This much is certain: Dewey and Major Herbert Bluechel drove to Ton Son Nhut airport in Saigon that morning but Dewey’s flight was delayed. Deciding to drive to a nearby OSS villa Dewey shouted in French as they neared a Viet Minh checkpoint. Because the British had forbidden Dewey to fly the American flag on his jeep,he was likely mistaken for a member of the hated Corps Expéditionnaire Français en Extrême-Orient. When the jeep came under fire Dewey was shot in the head and killed. Bluechel managed to escape to the OSS villa,where a fire fight with the Viet Minh raged for three hours. A rescue party of British Gurkhas arrived after the Viet Minh had retreated,taking Dewey’s body and jeep with them. Rumors swirled as to who had killed Dewey. The Americans blamed the British Special Operations Executive;the British blamed the Japanese (who had entered a truce on August 26th, a day after Japan’s formal surrender); the French blamed the Viet Minh. 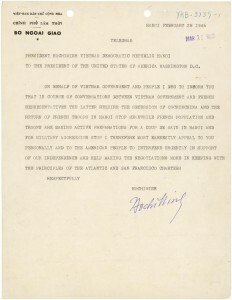 Ho Chi Minh sent condolence letters to Dewey’s parents and to President Truman, and ordered a search for Dewey’s body, which was never found. 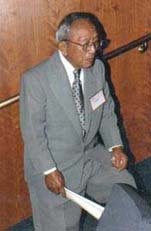 Some scholars believe Ho was insincere and had long manipulated the OSS. 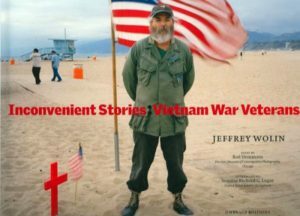 Having photos of their agents stand at his side,or posing with US weapons, demonstrated his international stature among the Vietnamese. And failing to see Ho as a Soviet-trained communist ideologue may have led to his emergence as a national leader and ultimately, as an enemy of the United States. 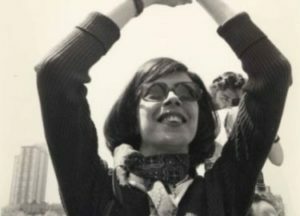 Among those attending the Asia Society meeting was Nancy Dewey Hoppin, the daughter of Peter Dewey, killed when she was an infant. 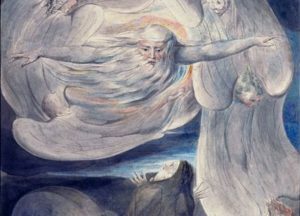 When the floor was finally opened to questions she demanded to know how her father had died. A hush swept over the elegant room. Those on stage were awkwardly silent. Finally,a modest answer was trotted out. But the full truth lay elsewhere. 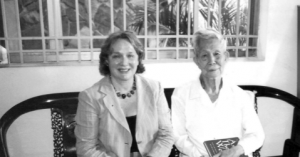 In 2005 in Saigon, still searching for answers to the fate of her father,Dewey Hoppin spoke with Tran Van Giau,an historian, former secretary of the Viet Nam Communist Party and chairman of the South Viet Nam Resistance Committee. 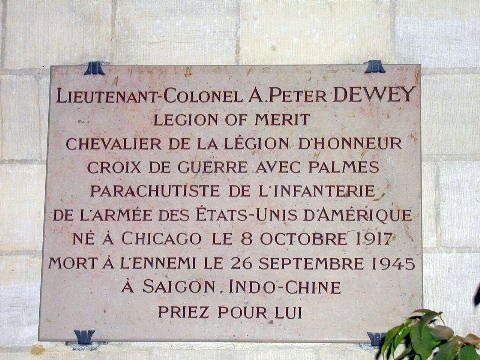 Citing a September 1945 report he received as commander of Viet Minh in South Vietnam,Giau said Viet Minh guerrillas,after attempting to retake Ton Son Nhut airport from the French,retreated to Saigon,set up a check point and fatally machine gunned the misidentified Dewey. After killing him,they stole the jeep and tossed Dewey’s body into a river. Having confirmed that the officer killed was not French,but a member of the OSS, Giau then offered his condolences to the Colonel’s daughter.